Dehydration is a common and sometimes fatal, health problem for pet turtles. While terrestrial turtles and tortoises usually dehydrate over an extended period of time, aquatic turtles can become dangerously dehydrated during shipping or transport. All tortoises should have regular access to clean, fresh water, even if you never observe them drinking. Spray fresh vegetables with water before you offer them to your turtle to increase the water content of their diet. Maintaining appropriate temperatures and providing burrowing opportunities will help to keep your turtle hydrated as well. For species that hail from rainforests, it is important to keep the cage humidity high by using moisture-retaining substrates, like cypress mulch, and regularly misting the enclosure with room-temperature water. Many keepers also soak their terrestrial turtles and tortoises in 1 to 2 inches of water for about an hour, once or more times per week. Closed or sunken eyes often are the most obvious sign of dehydration in many turtles and tortoises. A severely dehydrated turtle even may have dimpled corneas. The closed eyes complicate rehydration efforts, as these turtles may not forage for water, burrow or soak voluntarily. If your turtle has sunken and closed eyes, seek veterinary attention as quickly as possible to prevent long-term health problems or death. Always consult an experienced veterinarian regarding the health and treatment of your pet. A significant portion of a healthy turtle’s body weight is from the water in its tissues. Dehydrated turtles lack an appropriate amount of water, and accordingly, feel very light when held. A healthy tortoise should be surprisingly heavy when lifted. By monitoring the weight of your tortoise regularly, you can catch dehydration in the early stages. Dehydration causes fatigue and the loss of strength. Test this by pulling gently on the leg of your pet turtle. Most turtles will withdraw their leg quickly into their shell, if they do not or do so sluggishly, have your veterinarian examine them for dehydration and other illnesses. Old pets that are accustomed to their keeper may not withdraw their legs as quickly. Turtles that rest for abnormally long periods without moving, foraging or hunting for food may be dehydrated. Heavily misting the turtle’s enclosure may help to encourage your pet to move about and drink water. If this does not work, begin a soaking regimen immediately; if the turtle does not respond quickly, veterinary care is crucial. Though some turtle species have rough skin, it should lie smoothly against the muscle except in creased areas, like the inside of the elbow. Pinch the skin of your turtle gently; if the turtle's skin slides back into position quickly, he likely is adequately hydrated. 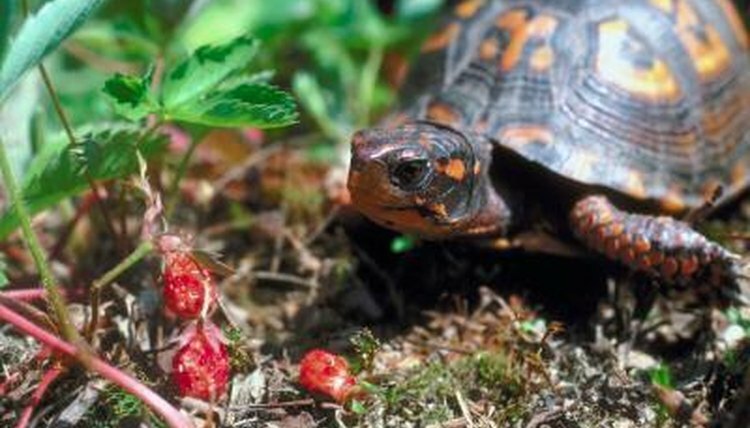 If the skin does not move back into place, or does so very slowly, your turtle likely is dehydrated. Gopher Tortoise Services, Inc: Why All the Concern About Gopher Tortoises?